Allow me to offer some brief backstory for this. I was one of the original beta testers of Workflow – the app that Apple acquired and relaunched as Shortcuts in 2018. I started covering Workflow all the way back in 2014 when it first launched on the App Store and, for the next four years, I created hundreds of workflows for MacStories readers. When Apple announced that Shortcuts would keep compatibility with old workflows created for the Workflow app, I knew what I needed to do. So after the new Shortcuts app launched in September, I began the slow process of re-downloading all my old workflows (starting from the very first review of the app) and updating them for Shortcuts with the ultimate goal of offering everything in a single archive. It took me months to go through the archives and determine which workflows were still relevant and which ones didn't make much sense for Shortcuts anymore. So while I was creating new shortcuts for the Shortcuts app, I was also updating old workflows (and sometimes recreating them from scratch) to take advantage of new techniques I've learned over the years and new features of the Shortcuts app. The result is an initial collection of 150 shortcuts that span 20 categories. 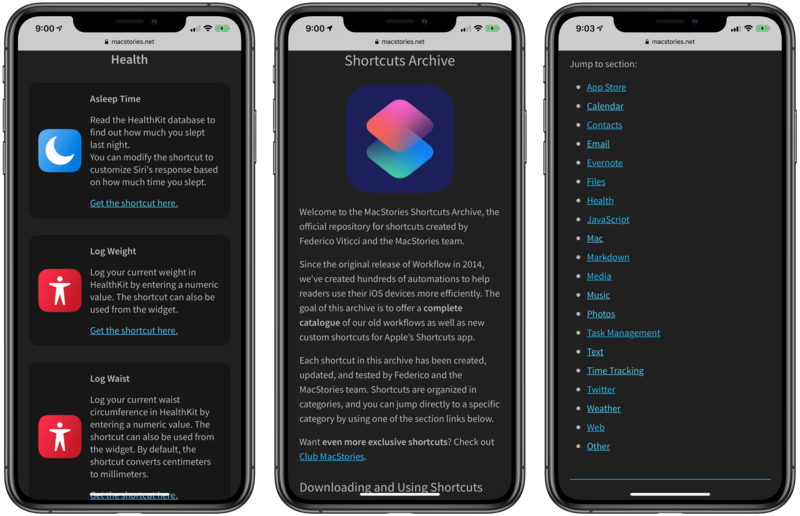 From Health and App Store shortcuts to Markdown automation and Photos shortcuts, there's a bit of everything in this archive. 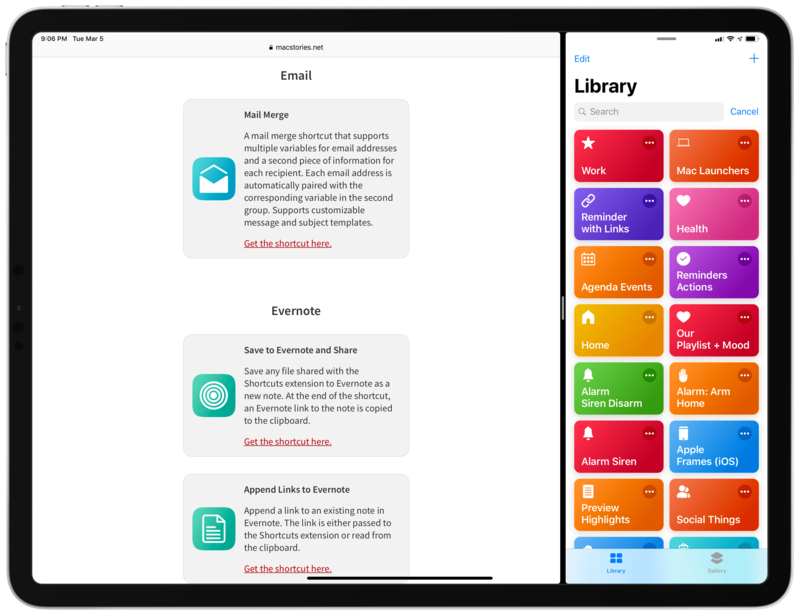 Whether you're a heavy Shortcuts user or have never dabbled with iOS automation before, I believe you'll find something that can help you use your iOS devices more efficiently in the archive. Once again: in the MacStories Shortcuts Archive you will find 150 shortcuts for the Shortcuts app that are available completely for free. Some of these shortcuts are old and have been rewritten for Shortcuts; the majority of them are entirely new and debuting on MacStories today. For years now, I have been building advanced shortcuts exclusive to Club MacStories members, and this will not change. At the same time however, I've also been sharing workflows and shortcuts as part of my "regular" articles at MacStories, but they were never easy to find unless you knew where to look. With this archive, my goal is to provide readers with a unified, constantly-updated catalog of all the shortcuts I've ever created and will continue to create for MacStories. If you like what you see and want to get even more on a weekly basis, that's what Club MacStories is for. The MacStories Shortcuts Archive is a product of love dedicated to the Shortcuts community. I believe Shortcuts is one of the most powerful pieces of software Apple has shipped in modern history, and I want to help iPhone and iPad users make the most of it so they can save time, be more productive, and enjoy using iOS as much as I do. For this reason, I encourage MacStories readers to feel free to modify, remix, and share shortcuts with others. Everyone's needs are different and I can only provide a template with my shortcuts. Ultimately, you'll have to understand how the Shortcuts app and Siri can help you on a daily basis. The way I see it, Shortcuts is the modern bicycle for the mind; it's up to you to decide where to go with it. From today on, all new shortcuts that I create for MacStories articles will also be available in the MacStories Shortcuts Archive. In the future, I plan to add better navigation tools to the archive as well as more old workflows I'm still working to update. I hope you'll enjoy the MacStories Shortcuts Archive and that you'll find some useful examples for the Shortcuts app. If you have any comments, questions, or ideas for shortcuts I should include in the archive, I'd love to hear from you.